EVA: What Does It Really Mean? 1. Get invested book capital from the balance sheet. 2. Make adjustments to convert accounting accruals to cash. 3. Make adjustments to recognize off-balance-sheet sources of funds. Steps 2 and 3 in this case are equivalent to steps that we took in the previous chapter in order to calculate net operating profit after taxes (NOPAT). A balance sheet says that total assets are equal to the sum of liabilities and stockholders’ equity. There is a problem with pulling a number directly from the balance sheet: the balance sheet also includes items which are not funding sources. For our purposes, we only want company funds or financing which has been provided by shareholders and lenders. In the case of short-term debt, for instance, we have a current liability. The company borrowed funds, meaning that this is a funding source, as well as a portion of invested capital. On the other hand, compare this to accounts payable, which are bills and invoices owed to the company’s suppliers. The suppliers are not actually lending funds to the company, nor are they investing in it. As a result, accounts payable does not make up part of invested capital. Figure 1 below is a balance sheet with accounts representing invested capital highlighted in the green box. It may be helpful to think of them as originating from sources which expect a return on this capital. It’s perfectly viable to calculate invested capital by totaling up the green-highlighted liabilities in the column on the right. Nonetheless, in most cases the items we wish to exclude from invested capital are usually listed as current liabilities as well. The items to exclude are non-interest-bearing current liabilities (NIBCLs). For this reason, a quicker way to calculate invested capital actually begins with the left-hand side of the balance sheet, the assets side. Then, subtract the items on the right which are not a part of invested capital. In Figure 1, this would be customer advances, accounts payable, and accrued liabilities. Given that the left-hand side equals the right-hand side, we can exchange the two columns in our calculations without disrupting anything. See Figure 2 below for an illustration of how this equivalency can be used to determine invested book capital. Why don’t we subtract taxes payable? You could exclude taxes payable, because the government is not considered to loan or invest in the company. Still, taxes payable is a judgment call on the analyst’s part. Many analysts let this item remain as a source of invested capital; we have done that in our example here. The reason for that is that most companies never pay these deferred taxes; they are perpetually deferred, meaning that they are “quasi-equity.” If the company is going to pay these taxes, they would then be excluded from invested capital. If the company holds on to the extra cash, we’ll need to charge them for using it. Next, we’ll see how this calculation plays out in our real-world example from Disney. In Figure 3, we see the result of subtracting non-interest-bearing current liabilities from total assets. We’ve included among liabilities a minority interest account of $4,130 million in our invested capital number. This minority interest includes partial interests in Disney subsidiaries which are held by other companies. As an example, if Disney owns 90% of a subsidiary, another company (or other companies) own 10%. 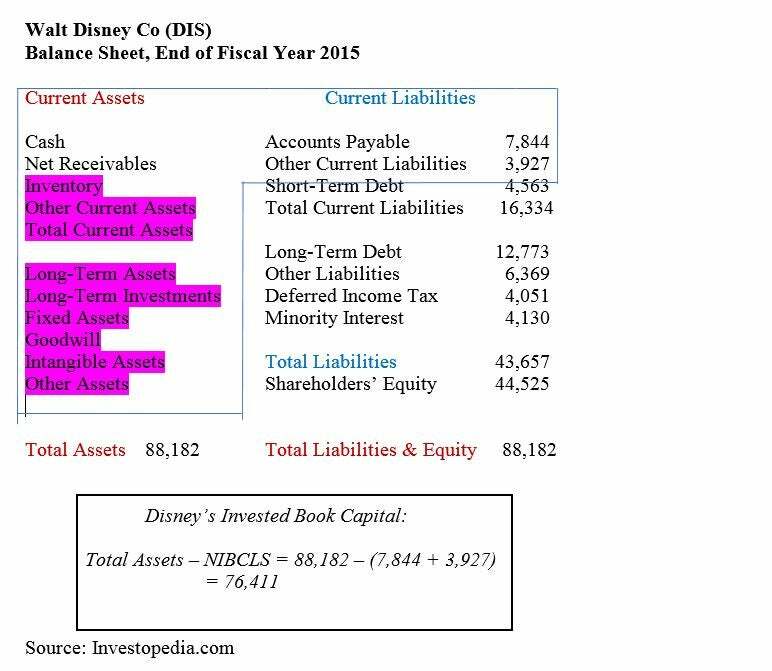 When we consolidate balance sheets, all of the assets are included in Disney’s sheet, although 10% of the subsidiary in question belongs to another company. We must then create a minority interest account which is equal to the other company’s ownership in the subsidiary. The result is that Disney’s equity account is reduced. Why would this equity account be included in invested capital? The reason goes back to the first economic profit principle: the most important thing is consistency between NOPAT and invested capital. When we calculated NOPAT, we started with EBIT, above the minority interest deduction on the income statement. Our NOPAT number has not been reduced by the minority interest. In order to be consistent, we have not reduced our invested capital by the minority interest either. One could subtract minority interest from NOPAT and from the invested capital calculation as well, although this is not done as commonly. Most important is consistency between the two. We’ve surmised the calculated invested capital, so now we must make two other types of adjustments: cash flow and off-balance-sheet adjustments. As before, we should be guided by the decisions we made in determining NOPAT. Figure 4 is a reminder of adjustments that we previously made in calculating NOPAT in the previous chapter of the tutorial. For consistency, we’ll match these adjustments on the balance sheet. First, when it comes to converting accrual to cash, we simply need to adjust the balance sheet in order to get closer to cash. Second, in order to capitalize debt/equity equivalents, we must capture investments or debt obligations that are not currently on the balance sheet for some reason. Disney holds many operating leases which are not economically equivalent to long-term capital leases, meaning that they represent a debt obligation (in the previous chapter, we estimated the present value of lease obligations at $2,068 million). In Figure 5, we’ll perform the cash flow adjustments and off-balance-sheet adjustments. In the worksheet above, the LIFO reserve (1) only applies if the company uses LIFO inventory accounting; as discussed previously, Disney did not in this case. The R&D note (2) refers to the fact that if the company had expensed R&D, we would capitalize it as an asset. In this way, we’re treating the money spent as if it had been used for a long-term asset, such as a manufacturing plant. 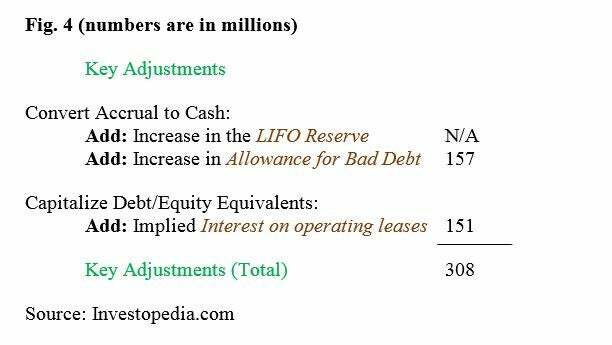 In both our adjustments here and those for NOPAT, we have adjusted to allow for bad debt, given that it is a paper reserve that does not reflect cash received. In both situations, we treated operating leases like capital leases, adding back the interest component and putting the obligation onto the balance sheet. The two “N/As” in the worksheet above are often significant to the calculation of economic profit, but they are not useful in Disney’s case. In our Disney example, we only needed two additions to arrive at an invested capital base of $78,636 million. This is a reasonable estimate of the assets which are funded by debt and equity sources. This chapter focused on calculating invested capital. Invested capital is a reflection of the total funds held on behalf of all financing sources, including shareholders and lenders. In economic profit calculations, we consider a company to be charged “rent” for the use of these funds; economic profit thus includes all profit which is exceeding this rental charge. Learn to use the composition of debt and equity to evaluate balance sheet strength. As an experienced or new analyst, liabilities tell a deep story of how a company finances, plans and accounts for money it will need to pay at a future date. Here is how to find, read and analyze a balance sheet from Apple. Companies with off-balance sheet debt will be brought to light when new rules come into effect in 2019. Cost of capital is the cost of funds used to finance a business. A company’s days working capital ratio shows how many days it takes to convert working capital into revenue.